You can configure a backup job to create backup files and a chain of storage snapshots on the primary storage array and/or secondary storage arrays. [For HPE Nimble] You must configure Volume Collection replication from the primary storage array to the secondary storage array. For more information, see HPE Nimble documentation. [For NetApp] You must configure volume SnapMirror/Snapvault relationships between the primary and secondary storage arrays. For more information, see NetApp documentation. Click Backup Job > VMware or vCloud on the ribbon. 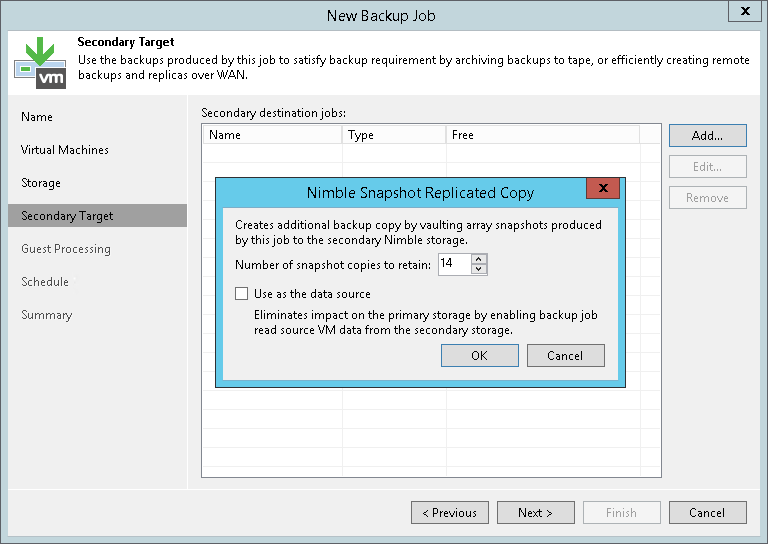 Veeam Backup & Replication will launch the New Backup Job wizard. At the Name step of the wizard, specify a name and description for the backup job. At the Virtual Machines step of the wizard, select VMs whose disks are hosted on the storage system. At the Storage step of the wizard, from the Backup repository list select a backup repository where you want to store backup files. In the Retention policy section, specify the number of backup restore points that you want to keep. Select the Configure secondary destinations for this job check box. At the Secondary Target step of the wizard, click Add and select primary or secondary storage arrays to create snapshots. In the Number of snapshot copies to retain field, specify the number of storage snapshots that you want to maintain in the snapshot chain. When this number is exceeded, Veeam Backup & Replication will trigger the storage system to remove the earliest snapshot from the snapshot chain. The number of snapshots in the snapshot chain on the primary storage array cannot be fewer than 1. This option is not applicable to NetApp SnapMirror and HPE 3PAR StoreServ Peer Persistence. On these secondary storage systems, Veeam Backup & Replication maintains the same number of storage snapshots as on primary storage arrays. If you use SnapMirror relationships between QTrees, you can define different retention policy settings for the primary NetApp storage system and NetApp SnapMirror. For example, you can configure the backup job to maintain 14 snapshots on the primary NetApp storage system and 10 snapshots of QTree directories on NetApp SnapMirror. 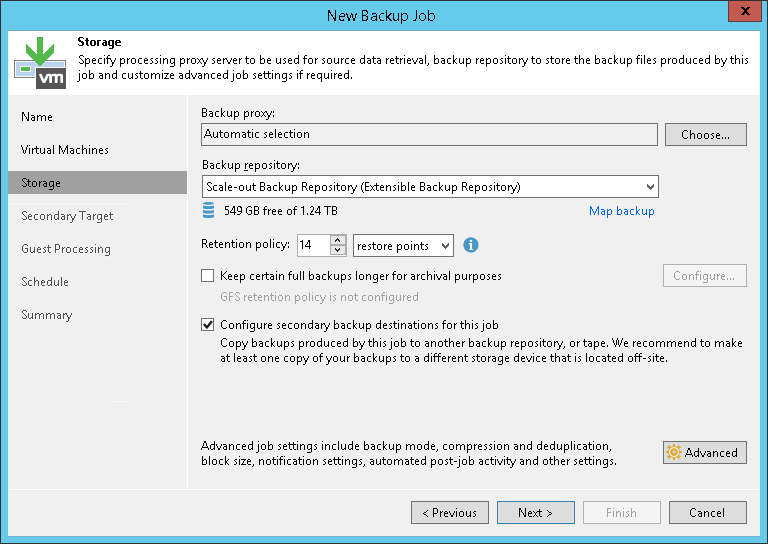 Specify other backup job settings as required. Click Next, then click Finish to save the job settings.